+ Announces Fall Tour for North America! Iconic independent hip-hop duo Atmosphere releases a new single titled “Make It All Better Again” today, via Rhymesayers Entertainment. “Make It All Better Again” showcases the inimitable and irresistible interplay between rapper Slug and producer Ant. Here, Ant produces a track that’s equally solemn and optimistic, while Slug weaves stories of heartache and loss mixed with the confident hope for a brighter tomorrow. Additionally, the group announces their North American headline tour scheduled for this fall, where they’ll be joined by Rhymesayers labelmate deM atlaS, as well as The Lioness, and DJ Keezy as support. Known for their passionate and engaging live performances, Atmosphere’s self-described brand of Dad Rap promises for an unforgettable run. General on-sale begins this Friday, August 10th, at 10am local time. Check out the full itinerary below. 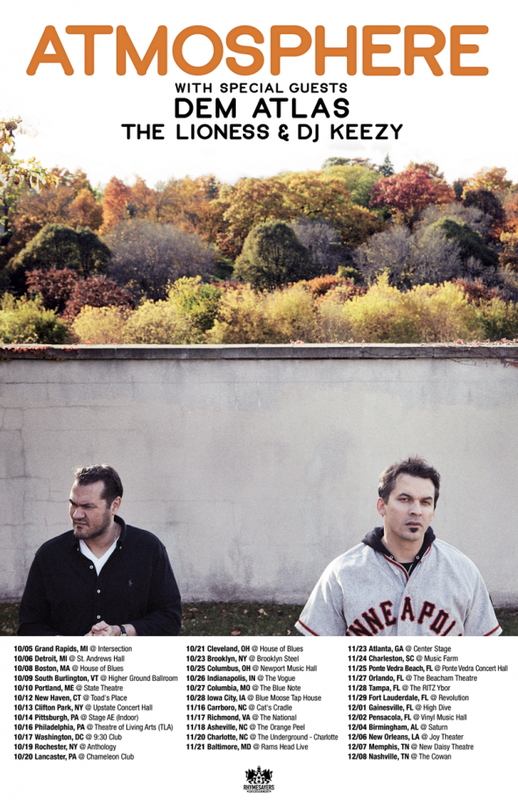 Atmosphere also has a few dates lined up before the tour kicks off. Catch them live in Las Vegas on Aug 24 (w/ support by J. Boog), at the Reggae Rise Up Festival in Utah on Aug 25, at Red Rocks in Colorado on August 31 (w/ support by Evidence, Grieves and deM atlaS), and at Riot Fest in Chicago, September 14-16. Tickets for these pre-tour dates and more can be found HERE.